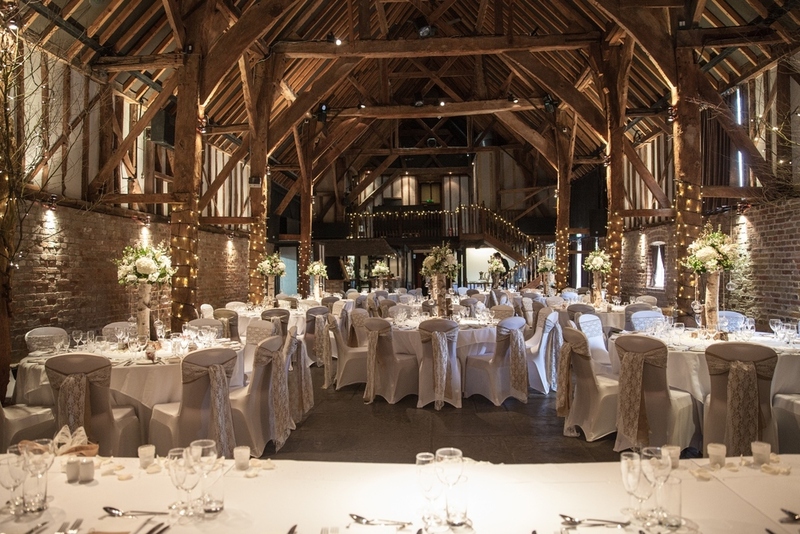 What’s not to love about our fabulous Tithe Barn. Cool in summer and warm and welcoming in winter. When the wall is flooded with tinted downlights the beauty and flaws in the structure are there to see along with the many years’ history as a working barn. We adore this building and take care of it to the very best of our ability and feel very, very privileged that it is ours. Anyway, what you really need to know is the machinations of how it all comes together. The Tithe Barn is not divided into different areas. It is one very large barn that can be adapted for large or small weddings with ease by just moving tables and creating focused areas. Many of our guests are electing to have fairy lights fitted to the down posts in the barn for their wedding day, it really does look very pretty. So from January 2017 we will be providing these and they will be permanently in situ. We use round tables, and again from the beginning of January 2017 the latest style of chiavari chairs will provide our in house seating. To create an intimate dining experience each table is lit by its own downlight. The bar is located at one end of the barn with a mezzanine floor directly above where the DJ and from time to time bands perform, and the kitchen is adjacent to the barn ensuring that your food arrives in tip top condition. We serve your wedding breakfast in the Tithe Barn and then when your meal and speeches are over you can lead your guests into the Heritage Barn where coffee will be ready. When your evening guests have arrived the Tithe Barn will be ready for you to begin your evening party.